You will earn 1,327 Reward Points. Earn 1 reward point for every 1 dollar spent. Hatco Drop-In Modular/Ganged Slim Heated Wells keep hot food at safe-serving temperatures, with better quality construction, longer holding times and more accurate temperatures. They are full-sized wells but placed lengthwise and grouped together in a modular fashion to provide customers with a complete steam table that has an easy reach, regardless of the sneeze guards. 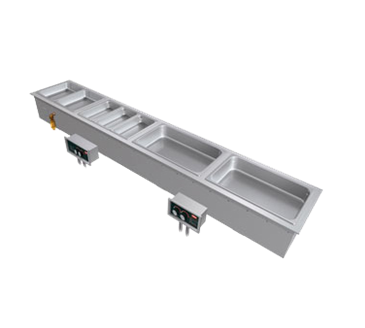 This one modular unit also means easy installation with a clean integrated look for your buffet line. Choose the number of wells, from 2 to 4 well configurations, as well as voltage, auto-fill, controls, drain, cord and mounting options. Each well has its own individual control to regulate the temperature of each separate food offering. The auto-fill option automatically fills and replenishes water without checking and maintaining individual or manifold drain options let you empty wells quickly and easily.